Blueberry seeds enjoy tremendous popularity for a reason. The plant has received its name mainly from the blue hues noticeable in the buds and in the leaves, but also due to the light and fruity aroma of the nug and of the smoke, too. Though this is a sensitive plant recommended for breeders who already possess a certain amount of experience, Blueberry is way worth the effort – no wonder this beautiful, fresh-flavored strain is a long-time coffee shop favorite. Consisting of 80%Indica and 20% Sativa, Blueberry has been around since the 1970’s. It was developed on the West Coast of the US after testing various Sativa strains native to Thailand, Mexico, and Panama and then mating them to a potent Afghani Indica strains. The resulting strain underwent further refinement during the 1980’s and the 1990’s, becoming what it is today: a masterfully created, highly refined and pleasantly relaxing variety. Blueberry has been tested in outdoors and indoors conditions as well, the final strain being best suited for indoor breeding. This A-lister strain is considered to be strong, but its high is energizing, rather than exhausting, making the plant equally favored by those who are looking for some relaxation as well by those who use cannabis for medicinal purposes. The sense of relaxation is achieved with the help of a sweet-tasting, fresh-scented nug that is also known for its stress relieving and pain killing qualities and has been successfully used in the treatment of chronic fatigue, migraines and depression as well. Blueberry buds are dense, too, but after harvesting they are not very sensitive to the humidity in the air, thus having a long shelf-life. Special looks that combine green and purple hues, a distinctive taste and smell and relaxation-inducing effects that cannot be mistaken for the sensations provided by any other variety – these are the features that account for the popularity of this extraordinary strain. You will need a little bit of experience to be able to provide your Blueberry seeds with the best treatment, but the rewards are definitely worth it. 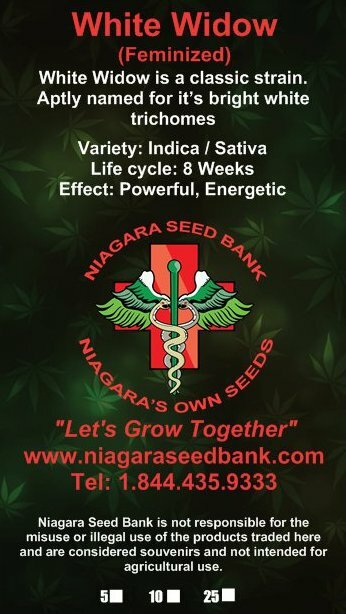 Seeds of the highest quality, from the most renowned and most reliable suppliers, outstanding customer service, quick and easy purchase, discreet delivery and convenient prices – these are the features and qualities that make our Canadian seed bank your go-to source of marijuana seeds. If you are planning to grow your own plants, we will not only supply you with the best seeds, but we will also assist you every step of the process. You will surely be able to find what you are looking for in our vast inventory. Classic seeds with a long-standing reputation, numerous award-winning strains, innovative products that make the most of modern breeding practices, autoflowering varieties and feminized strains are all there in our extraordinary selection. Strains developed specially for medicinal purposes and recreational varieties are readily available in our bank as well – browse our inventory to look for the desired effects, and you will see that, whatever your expectations, we are the go-to Canadian seed bank that can meet and even exceed them. Our selection will also meet growing-related requirements – whether it is indoor varieties that you are looking for or you want seeds that perform well outdoors, whether you are a beginner looking for a strain that is easy to handle or you are an experienced grower who can handle sensitive strains, you will find what you are looking for among the seeds we supply. We make quality our top priority not only when it comes to our seeds, but also when it comes to the ordering and delivery process. Our ordering and payment system is easy to use and, with us, you can be sure your purchase is safe and your data confidential. We do everything we can to guarantee the highest service standard from every aspect – order placement is fast and straightforward, and the delivery will be prompt and discreet. Try our products and services – check our massive inventory, find out about our various strains from the detailed descriptions attached to each of them, then make up your mind about the variety that works best for you or contact us for more information. Our Canadian seed bank provides products and services of the highest quality, and we have proven time and time again that we are a provider you can trust completely. Since you are reading this and not Pop-Tart instructions we have obviously we have made the bold decision to put in the effort and bring you our thoughts in the hope to educate,share, and inform. We intend to be a thought leader on subjects surrounding our products and beyond… world peace who knows?